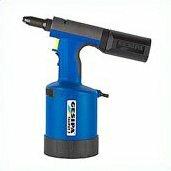 Pneumatic hydraulic rivet tool designed for high volume use and reliability. High level of common parts for low spare parts inventory and easy maintenance. Traction Power :- 14000N @ 5 bar.